Meanwhile, in small bowl, combine broth, vinegar, soy sauce, cornstarch and sugar; blend well. Set aside. Heat oil in 12-inch nonstick skillet or wok over medium-high heat until hot. Add shrimp, onions, ginger root and garlic; cook and stir 3 to 5 minutes or until shrimp turn pink. 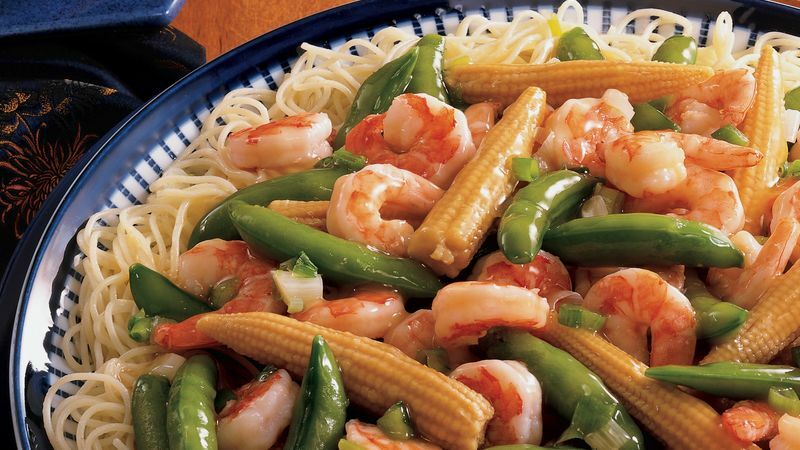 Stir in cornstarch mixture, corn and sugar snap peas; cook and stir 2 to 4 minutes or until sauce thickens slightly and mixture is thoroughly heated. To serve, arrange pasta on large serving platter. Spoon shrimp mixture over pasta.